The Sheep Whisperer: "Top Ten" Animal Dads! 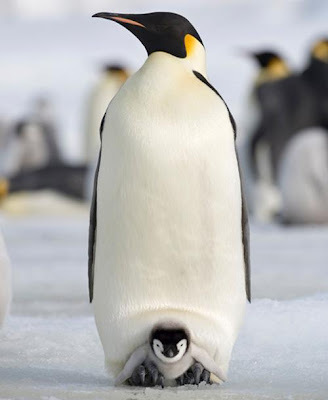 In honor of Father's Day, I thought I would look into the world of nature the next couple of days, & nominate a "Top Ten" list of "Animal Dads." I hope Ewe enjoy my findings on this very special day that we use to honor our Dads. On a personal note, I lost my Dad on Dec. 25, 1997, & truly appreciate how he loved us & set an exemplary example. He was humble, wise, generous, responsible, & very serious about his role as a husband & father! He is missed, loved, & his thumbprint on our lives will always be recognizable & remembered! Happy Father's Day, Dad, & to all the Dads that are celebrating this year. Don't worry, Daddy's watching out for Ewe! Daddy will keep Ewe warm, but Ewe must stay under the "covers"! Calling all Dads! Let's huddle together & call the "Play"! 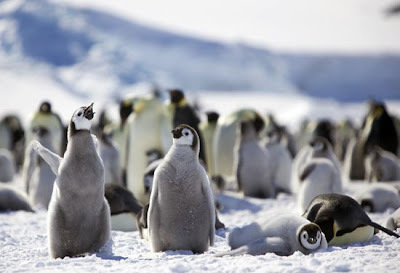 Emperor Penguin Dads are my first choice for my "Top Ten" list & have the arduous task of incubating the family "Nest" egg in very harsh conditions. Mom delivers the egg & leaves to get something to eat for a period of about 2 months! Dad has to huddle together with all the other abandoned "Dads" & keep the egg warm in up to 76 degree below zero temps! They keep the egg balanced on their feet in a pouch under their feathered skin known as a brood pouch. They stand braving the elements & do not eat until the female returns from feeding. 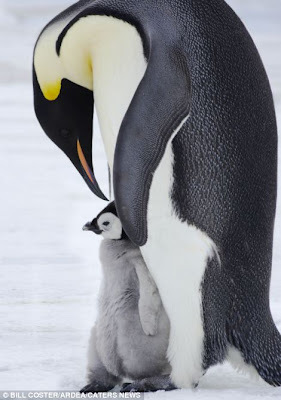 Once the chicks are hatched, the "Dads" even feed the chicks with milk from glands found in their esophagus. Wow! Now that's a dedicated Dad! When Ewe are a Jacana, being a Dad is serious business! As a Jacana Dad, Ewe have to walk "Lightly" & carry a "Load" of Responsibility! 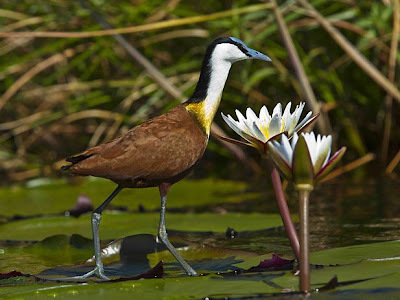 Jacana Dads "Work Hard", making nests & incubating eggs! 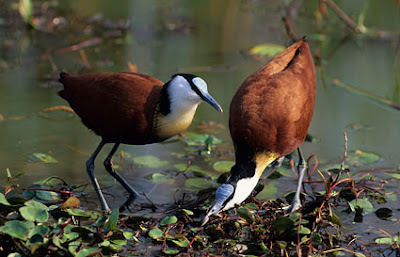 Jacanas are my next choice for my "Top Ten" list, & are located mostly in Central America ,Cuba, & Haiti. Males make great Dads because they take responsibility for the family. They construct their nests, incubate their eggs, & care for their chicks. Ewe might say that they are Ewer genuine "Mr. Moms"! They also remain loyal Dads, even though the females are out gallivanting. As a matter of fact, they will even care for eggs that are not their own. I am a wise old owl! Father does know best! Being a good Dad is Hard Work! 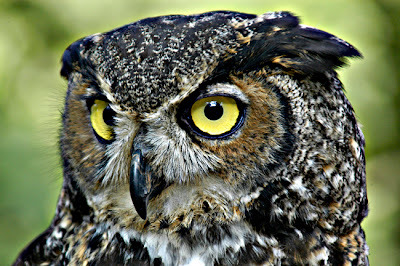 Great Horned Owls are another selection for my "Top Ten" list & make very responsible Dads. They have to establish a territory for their nests, attract mates, find nests for their eggs, & then the real work begins! While Moms incubate the eggs, Dads must locate & deliver the food. They have to feed both their mates & themselves, which require an abundance of mice, especially since their mates are bigger than they are! Dads are very protective of their families & will stay with their mates for life. I would definitely be considered a "DEAD BEAT DAD! Raising a family is overrated!? I would rather hang out with my BUDS! 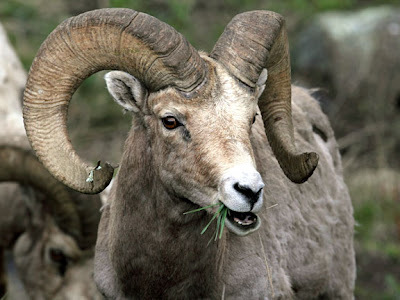 Unfortunately, male sheep or (RAMS), do not make "Top Ten" Dads. The Shepherds & "Moms" or (EWES), carry all the responsibilities related to the raising of the sheep family. 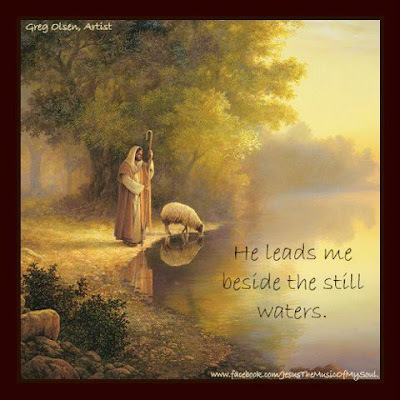 Shepherds fulfill the Dad's role in the sheep family! As Ewe reflect on Father's Day, make sure to thank God for Dads! They are so critical to the strength & stability of the family. My second-favorite kind of bird would probably be an owl. 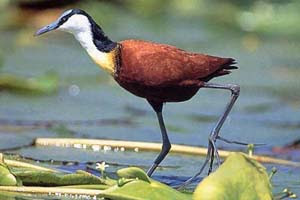 Also, I haven't even heard of a Jacana before, so that was a nice suprise! I think that the penguin was the best choice of all though! Hi Alan! Thanks for commenting! I agree with Ewer first choice of Penguin. After Ewe see "Happy Feet", how could Ewe vote for anything else? 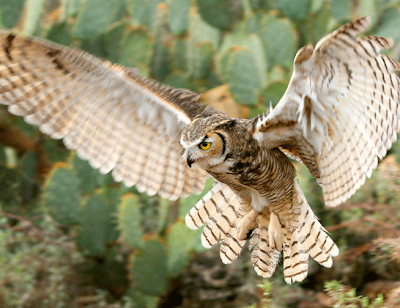 Owls are also a great pick. I'm glad we were able to surprise Ewe with Jacanas & I'm looking forward to seeing Ewe soon! God Bless Ewe! Love, Pop Pop!